5.7 Earthquake hits near the east coast of Honshu, Japan. Zimbabwe – The Bulawayo-Masvingo highway was closed to traffic yesterday after the Nkankezi bridge was washed away by raging floodwaters after the Sukasihambe dam burst it wall upstream on Sunday night flooding the Nkankezi river. Massachusetts, USA – Conway, a small town in western Massachusetts is recovering after an EF-1 tornado cut a path of destruction through it Saturday night, destroying a barn, severely damaging several houses, and ripping apart hundreds of trees. It was the first-ever tornado to touch down in the Bay State in February. Researchers working in the South Pacific have captured stunning footage of a deep-sea jellyfish that looks like a flying saucer with tentacles. Marine biologists working on the National Oceanic and Atmospheric Administration’s Okeanos Explorer spotted this beautiful jelly at Utu Seamount in the National Marine Sanctuary of American Samoa. A farmworker from the Omaheke region on the eastern border of Namibia has died from Crimean-Congo hemorrhagic fever (CCHF), according to Namibia health officials. According to a report in The Namibian, The unidentified man died on Feb. 22 after being admitted to the Gobabis District Hospital when he vomited blood. He was treated for fever, diarrhoea, and coughing a few days earlier. Pakistan’s Ministry of National Health Services, Regulations and Coordination has reported cases of chikungunya in the country for the first time. A total of 803 cases have been reported since 19 December 2016 in the Sindh province, including 29 cases reported in various towns in Karachi during the week of 10-16 February 2017. Haiti has reported 1,897 cholera cases through January, according to the Pan American Health Organization (PAHO). 28 deaths were reported during this period. Since the cholera outbreak began in October 2010, months after the Jan. 12, 2010 earthquake, 797,691 cholera cases have been reported in Haiti, including 9,439 deaths. Some residents in a rural area of El Paso County have been evacuated because of a prairie wildfire.The El Paso County Sheriff’s Office says the fire was reported around noon Monday about 10 miles east of Fountain and near the small community of Hanover. The fire has burned about 10 square miles, and smoke could be seen from Colorado Springs. 5.1 Earthquake hits Hokkaido, Japan. 5.0 Earthquake hits near the east coast of Kamchatka, Russia. Chile – Floods caused by Andean rainfall are causing havoc in central and northern Chile, and authorities said Sunday that at least three people had been killed and several were missing. Emergency officials in the South American country said waters rushing down from the Andes since Saturday afternoon had caused landslides, cutting roads and isolating thousands of people. Falling rocks and other debris overwhelmed the intakes for urban water systems, cutting service to about 1.2 million homes in the area around Santiago. Ireland – Storm Ewan brought winds of 100km/hr when it made landfall today. Met Éireann says the south and south-east will be worst affected, but it did not reach the strength of Storm Doris. Several areas in the West and Midlands also felt the brunt of Ewan with flash flooding reported in parts. Malaysia – More than 10,000 people from at least 15 longhouses as well as students from a school in the interior Baram district in northern Sarawak have been cut off due to floods. Over the past 24 hours, heavy rains have inundated these populated settlements, resulting in metre-deep waters. The Fiji Ministry of Health has recorded 143 dengue fever cases since the beginning of the year, according to a Fiji Times report. Health officials note that Western Division has reported the most at 88, followed by Northern Division (30) and the Central/Eastern Division (25). Health officials are urging the public to take immediate actions to destroy dengue mosquito breeding places. Dengue infects nearly 400 million people across more than 120 countries each year. Most survive with few or no symptoms, but more than two million annually develop what can be a dangerous dengue hemorrhagic fever, which kills more than 25,000 people each year. The African swine fever (ASF) has broken out in the western Tanzania’s district of Kalambo District, killing nearly 200 pigs, an official said Sunday. Julieth Binyura, Kalambo District Commissioner, confirmed the outbreak of the deadly disease, saying villagers had been informed on the viral disease. The disease, which has a high mortality rate in pigs, has caused panic in the area where pig farming has been a booming business. Binyura said her office had banned pork business as well as transportation of live pigs in the district to contain the disease in the area, which is part of Rukwa Region bordering Zambia and Lake Tanganyika on its western side. 5.3 Earthquake hits La Rioja, Argentina. 5.1 Earthquake hits the Philippines. 5.0 Earthquake hits Atacama, Chile. Bosnia – Flooding from a new lake created by a landslide of mine waste shut down one of Bosnia’s main highways Saturday and raised fears of further flooding. Earlier this week, a massive landslide of mine waste from an open pit coal mine had blocked a river near the central Bosnia town of Kakanj, creating the lake. The lake overflowed Saturday morning following heavy rain overnight, forcing the closure of a busy highway connecting the capital of Sarajevo with the central town of Zenica. The town of Kakanj is 50 kilometers (31 miles) north of Sarajevo. The China National Health and Family Planning Commission reported an additional 28 human cases of avian influenza A(H7N9), including four deaths, for the period of February 13 to 23. The 22 male and six female patients aged from four to 81 had their onset from January 27 to February 17. In a follow-up on the multistate Seoul virus outbreak in the United States, the Centers for Disease Control and Prevention (CDC) reports laboratory-confirmed infection in 16 people in nine states as of Feb. 23. 6.3 Earthquake hits south of Fiji. 5.2 Earthquake hits Tarapaca, Chile. 5.1 Earthquake hits Manipur, India. Nature’s clock is running fast in the Arctic, thanks to climate change. Due to diminishing sea ice cover, spring is coming sooner to some plant species in the low Arctic of Greenland, while other species are delaying their emergence amid warming winters, says a study. While how early a plant emerges from its winter slumber depends on the species, the study, published in the journal Biology Letters, demonstrates that the Arctic landscape is changing rapidly. Such changes carry implications for the ecological structure of the region for years to come. Warming winters and springs associated with declining arctic sea ice cover created a mixture of speed demons, slowpokes and those in between. One racehorse of a sedge species now springs out of the proverbial gate a full 26 days earlier than it did a decade ago. 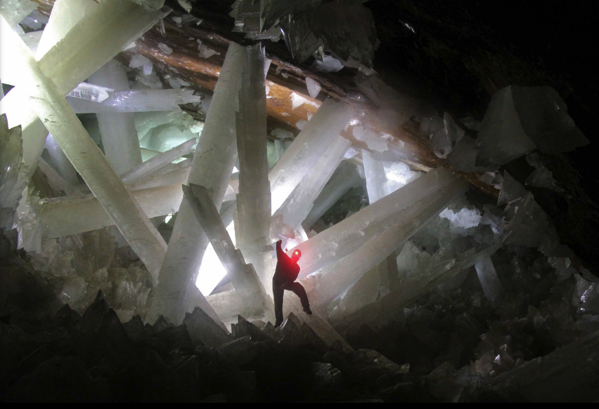 Shimmering Cave of the Crystals – giant selenite crystals in a chamber in the Naica Mine in Mexico. This Sunday (Feb. 26) brings the first solar eclipse of 2017. Unlike the total solar eclipse that will cross the continental United States in August, Sunday’s spectacle is an annular eclipse, which means a sliver of the sun’s surface will still be visible around the moon. The moon will appear to block varying amounts of the sun depending on where you are located within the eclipse visibility zone. For those who are properly positioned along a narrow path some 8,500 miles (13,700 kilometres) long and averaging roughly 45 miles (72 km) wide, the dark disk of the moon will briefly be surrounded by a dazzling “ring of fire” as the lunar disk passes squarely in front of the sun. Skywatchers positioned outside this path can still enjoy a partial solar eclipse. 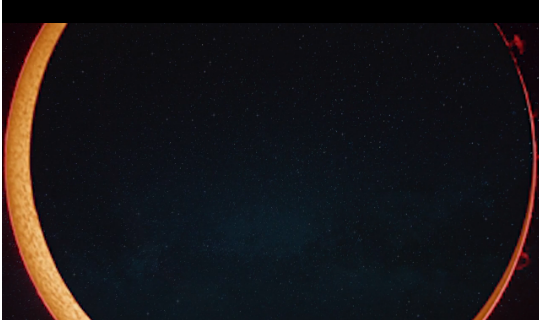 This spectacle will be visible to more than half a billion people living across the lower two-thirds of South America as well as the western and southern portions of Africa, as well as the sparse population in about half of Antarctica.